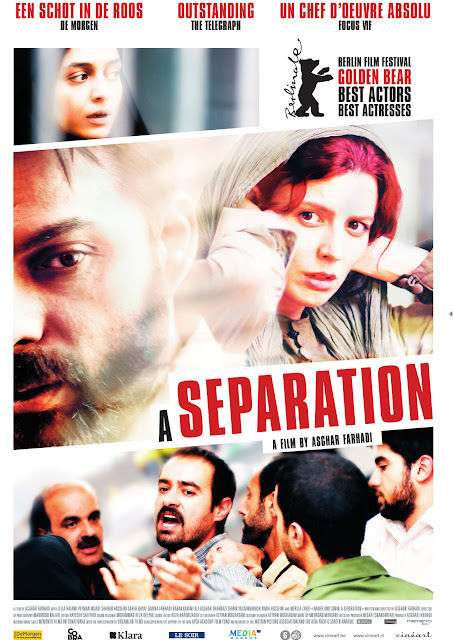 A Separation is a film written and directed by Asghar Farhadi. It premiered at the 2011 Berlin International Film Festival, winning the Golden Bear for Best Film, and sweeping the Silver Bear awards for Best Actor and Actress which were given to the entire ensemble cast. It is also Iran's official submission to the 84th Academy Awards for Best Foreign Language Film. 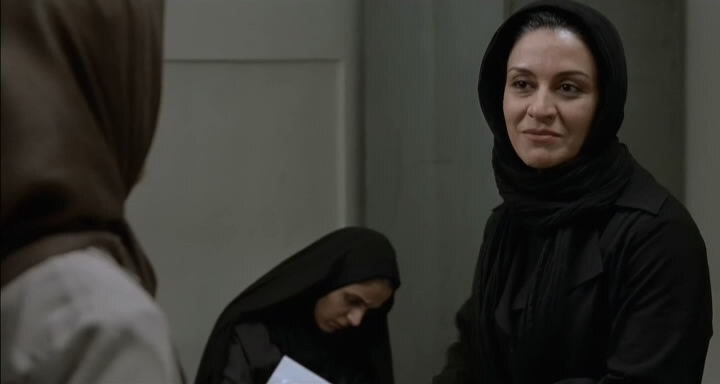 Farhadi has delivered a flawlessly written and rendered film set in contemporary Iran. One that has a deceptively simple story but unravels with multiple layers of complexity while staying completely realistic and believable. With a minimalistic and natural style reminiscent of films from the recent Romanian New Wave, A Separation is both foreign and familiar. It succeeds not only with an accurate portrayal of present day life in Iran, but also an universally accessible story that poses valid questions no matter what country or background the viewer happens to be from. It starts out with what seems like a straight forward ho-hum divorce and custody squabble between Nader (Peyman Moaadi) and Simin (Leila Hatami), arguing their cases in front of a judge. This "small issue" however soon spirals into a moving and captivating mystery and examination of many aspects of modern society. Here the director takes no sides and fairly lays out the reasons and motivations for every single one of his characters. Whether man or woman, rich or poor, traditional or progressive, religious or secular, there are no heroes or villains, only people who try to do what they think is the right thing. The only clear message is that it's the children who pay the cost when adults fight. The entire cast is outstanding and completely deserving of their accolades. Most notable is the director's own daughter Sarina Farhadi who plays Termeh, the 11-year-old caught between Nader and Simin's conflict who is forced to make an impossible decision. Her performance is quiet yet poised and emotionally devastating and is possibly the most sympathetic character in the film, alongside Somayeh (Kimia Hosseini) the other innocent child dragged into a situation beyond her understanding by her parents. This is a wonderfully crafted, powerfully entertaining and thought provoking drama. It's easily one of the best films of the year, and should at the very least garner an Oscar nomination come January. As of today it's my front runner in the race. Ryan McNeil has bet that this one won't get enough LambScore submissions to get posted. You should submit your review in the forums and prove him wrong! From my point of view, It's an accessible story, very well written and acted, and shows a side of Iran we don't often see in the West. Which film would you choose for the award? This film is a usuall film. I dont understand, why and how this film has a chance in Oscar to win? 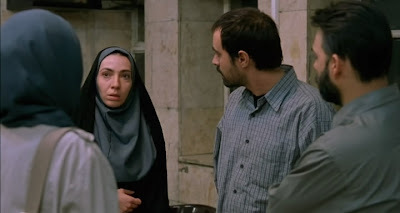 Farhadi allows you too judge about the characters! after we saw the movie all of us say something different about the characters, I think that's good. Thanks Chris, I will keep that in mind. Thanks Amir. I've only seen Kiarostami's latest but that doesn't count as an Iranian film. I will definitely make an effort to see all of the ones you've mentioned here. 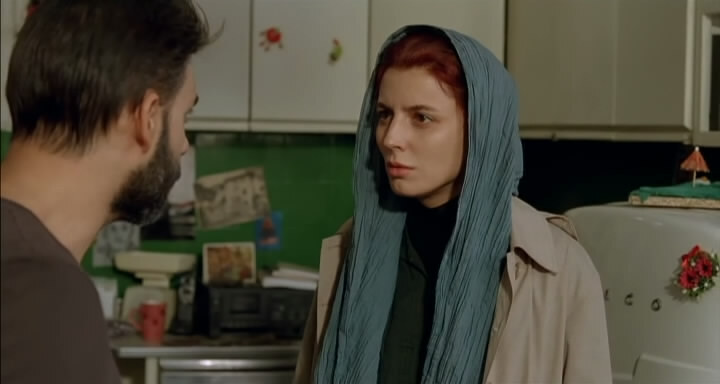 Farhadi's earlier films are all amazing but especially 'About Elly' and 'Fireworks Wednesday' which I think should be easier to find and more accessible are must-see films. 'Children of Heaven' is the only Oscar-nominated Iranian film, it's a good one. The same director also has 'Color of Paradise' and 'Song of the Swallows'. Of the older stuff, if you can find 'Cow', it's generally agreed upon as the greatest Iranian film of all time, and not without reason either. Hope it helps, and hope you enjoy it! Can't tell if you are being serious or sarcastic... whichever the case, thanks for reading HR. It's actually the oxygen supply, but I thought the same thing. I admit I'm not very familiar with Iranian cinema Amir, could you recommend some other essential films? I'm sure a dvd or similar quality version will be available sooner rather than later. Me too, I've been meaning to see more of Abbas Kiarostami's work and this has given me a great reason to. Yeah quite an eye opener especially because the media never paints a positive picture of Iran for us to see. I think the most important thing it accomplishes is it shows modern Iran in a light we don't normally get to see in the west, at least not here in North America. Now that I think of it, this was my first Iranian film too. I will definitely be seeking out more of them, I just love the sound of the Persian language. That ending shot was genius. I didn't laugh but I did cheer out loud when I saw the credits appear over top of the picture. I know what you mean, I always run into the same kinds of scheduling conflicts at film fests. I also think it has a good chance of winning. Though I still have a lot of films to see to say for certain. One more award nominee that I won't be seeing simply because...I just can't enjoy movies like some of you people! I feel so bad now. This movie could possibly open my eyes to new cinematic experiences, but it doesn't have any explosions, so I am afraid I shall have to pass. It's a B.T. front runner too! When I saw that kid messing with the IV, I thought "Dumb kid." I'm hoping it will score a Best Screenplay nomination as well. This screenplay should be taught in film school. Without ever feeling contrived, its mystery is so layered. What it does best, as you point out, is that it makes feel like a simple and straightforward story when it's not. And also, rarely can Iranian film portray the lower class and the upper middle class without exoticizing the former or feeling completely blase about the latter. A Separation marries both classes and doesn't fail in its portrayal of either. It's so effortlessly realistic. I wish I could rent this. It sounds amazing and I'm feeling in the mood for something like this anyway. Serious, well thought out, well made. 5 Stars from me. An amazing film and one of the best of 2011 as you say. The moral complexities and what this film teases out about Iranian social, cultural, legal and class status is incredible, as are all the performances. I was blown away. Best Foreign Film sewn up unless something amazing comes along! ..and quite current with it's message. I really wanted to see this film at the NZFF, but it was literally straight after Melancholia and the showing was sold out by the time I went to get my tickets. It looks *really* good, I hope it comes out here soon! I think this will probably get an Oscar nomination, and probably win. Thanks, I always forget to check the forums and submit my scores. I've been eagerly anticipating your review for this, and you didn't disappoint! It sounds like a truly amazing story, and I'm really hoping that it pulls off the win at the Oscars. This was the first Iranian film I saw, and I'm eager for more. As you say, it's a very realistic film without good or bad people, and I was impressed by all of the actors. When the credits rolled, the whole audience started laughing, actually. It was important for my impression of the whole film, very nice twist.